[133 Pages Report] Industrial Films Market size is projected to reach USD 55.73 Billion by 2022, at a CAGR of 4.2% from 2017 to 2022. In this study on the industrial films market, 2016 has been considered as the base year, while the forecast period that has been considered is from 2017 to 2022. DuPont Teijin Films (U.S.), Saint-Gobain (France), 3M (U.S.), Berry Global Group (U.S.), RKW SE (Germany), SKC Co., Ltd. (South Korea), Toray (Japan), Mitsubishi Chemical Holdings Corporation (Japan), DuPont (U.S.), and Eastman (U.S.), among others are the key players operating in the industrial films market. This report categorizes the industrial films market based on film type, end-use industry, and region. The industrial films market is projected to reach USD 55.73 Billion by 2022, at a CAGR of 4.2% from 2017 to 2022. The growth of the industrial films market is driven by the increased use of industrial films for various applications in different industries. Moreover, increasing demand for bi-axially oriented films and growing consumption of industrial films in the Asia-Pacific region are also contributing to the growth of the industrial films market across the globe. Based on film type, the industrial films market has been segmented into linear low-density polyethylene (LLDPE), low-density polyethylene (LDPE), high-density polyethylene (HDPE), polyethylene terephthalate/bi-axially-oriented polyethylene terephthalate (PET/BOPET), polypropylene/bi-axially oriented polypropylene (PP/BOPP), cast polypropylene (CPP), polyvinyl chloride (PVC), polyamide/bi-axially oriented polyamide (BOPA), and others. The LLDPE film type segment is estimated to account for the largest share of the industrial films market in 2017 in terms of volume and is expected to continue its dominance during the forecast period as well. The growth of the LLDPE film type segment of the market can be attributed to the increased demand for LLDPE films as they are cost-effective and offer superior properties such as high relative transparency, increased tensile strength, excellent puncture resistance, and superior impact strength. Based on end-use industry, the industrial films market has been segmented into agriculture, transportation, medical, construction, industrial packaging, and others. The agriculture end-use industry segment is projected to lead the industrial films market during the forecast period in terms of both value and volume. This segment is also projected to grow at the highest CAGR between 2017 and 2022 in terms of both value and volume. The growth of the agriculture segment of the industrial films market can be attributed to the increasing need to preserve the quality of the agricultural produce and decreasing arable land across the globe. Industrial films are being increasingly used in the agriculture industry to enhance crop yields and resist effects of climatic changes on crops. The Asia-Pacific industrial films market is projected to grow at the highest CAGR during the forecast period, in terms of both, value as well as volume. It is one of the most promising markets for industrial films, both in terms of production and consumption. 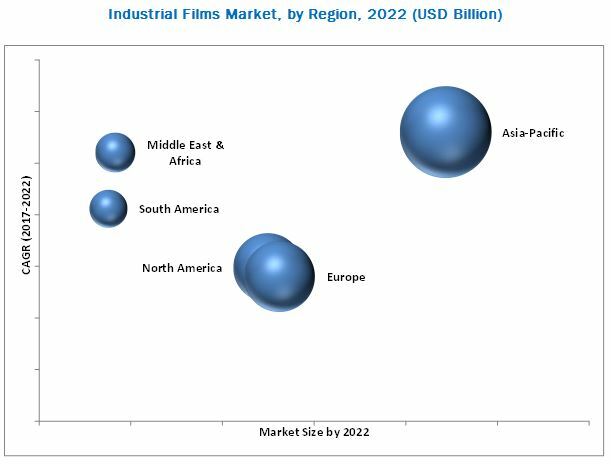 Favorable government policies & initiatives and rapid industrialization in the Asia-Pacific region offer growth opportunities for the industrial films market in the region. Increasing investments in infrastructure development projects, growing production of automobiles, and rising use of industrial films in the agriculture industry are the factors expected to drive the growth of the Asia-Pacific industrial films market during the forecast period. Strict implementation of various environmental regulations is the key factor expected to restrain the growth of the industrial films market across the globe. Expansions, new product launches, and mergers & acquisitions are the major strategies adopted by leading players to enhance their positions in the industrial films market. Companies such as DuPont Teijin Films (U.S.), SKC Co., Ltd. (South Korea), 3M (U.S.), Toray (Japan), Berry Global Group (U.S.), Saint-Gobain (France), and RKW SE (Germany) are the key players, who adopted these strategies to expand their product offerings, increase their customer base, and enhance their manufacturing capacities to stay competitive in the market.